These two talked with me the whole drive down there, asking how to look cute, and natural, but not too cute, not the fake kind of cute, but not awkward. I giggled as I told them, that's what they all say. So we took our time exploring and I captured a few more natural moments. Then when I started in on the more orchestrated portraits, I told them to whip out their "dad jokes." I am once again impressed by the cuteness and joy that emerges. 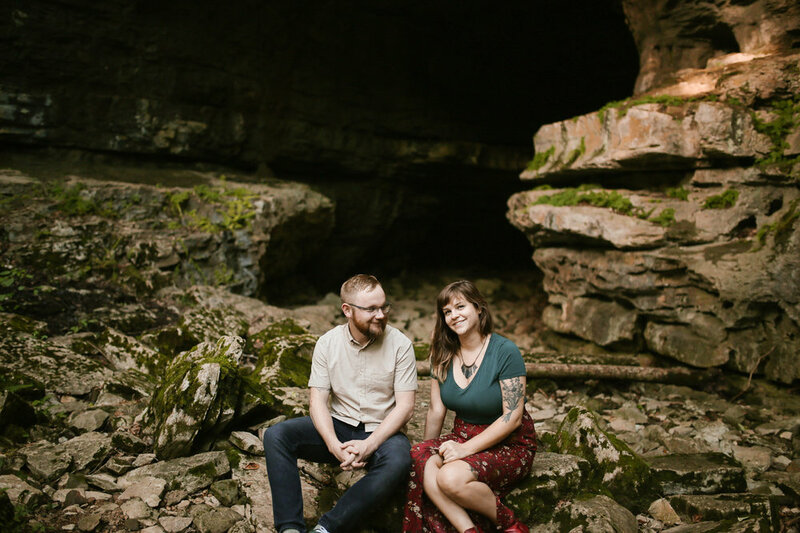 This couple in particular put up with my dad jokes and tripping over rocks, while looking fabulous in the portraits I capture. And it was even a pleasure to get some time in the car with them. I laughed so much and can tell these guys will have a good time in any setting. October can't come fast enough. I was very honored to follow Brittany and Ben around the beautiful Rockies. They got an airbnb outside Boulder, with a view of mountains (and Denver.) Their puppy, Sally, came along for the ride. The morning of the wedding was rainy and quietly energized. Brittany and Ben spent the morning apart and had an intimate first look outside their airbnb after donning on their wedding attire. Piled in a car, we started out along Trail Ridge Road. When we came over a peak, we knew exactly where their ceremony would be. The mountain range being them offered the perfect backdrop to tearful vows, and a long kiss. My boyfriend Josh, officiated the ceremony and played soft acoustic tunes during the ceremony and we took some portraits afterwards. We drove around during the last bit of daylight and captured some mountain reflections on a lakeside and enjoyed a tasty sandwich on an outdoor patio with Sally in Boulder. The day was unpredictable, the weather forecast warned of rain and flash thunderstorms, but we only saw sunshine, fluffy clouds, chilly winds and a soft sunset. All together, a smashing success. Congratulations Ben & Brittany, you nailed it. Christi & Jessica contacted me a little over a year ago, for their Kentucky wedding plans. I was so excited to be apart of their big day, and then they had an unexpected move to Northern Indiana. While the news was super sad, I wished them all the best of luck. Then at the end of last year, they contacted me with the most wonderful news. They were expecting to add an addition to their family and wanted maternity portraits up north! I love to travel, especially to new places. Christi grew up in this magical place on Lake Michigan that would make you believe you were on the beach and on the edge of the world. When she suggested we take the portraits there, I immediately agreed. And despite a rainy forecast all weekend, we got a short break from the weather to enjoy this sandy oasis.